This week was my week on the Dalmatica - the electronic jacquard. What a fun machine! First of all I will confess that my focus was less on design and more on how to get it to make the structures that I wanted. Next time I come back I want to focus on combining the two. So my first project was making gauze circular pockets for which to put things in. The design is very loosely based on draping lines. The lolly wrappers (carta caramella) inside the pockets are courtesy of Marta, one of the amazing production weavers at Lisio. Marta is great fun and hands these delicious little morsels out at the perfect moment. Colour test strips and first test of repeat. Detail so you can see the lolly wrapper cut up - the lolly is called 'Specchi' which means section. I think this one was lemon flavoured. The finished length. Will take better photos when I get home. I made enough to make something with - maybe a skirt or a laptop bag? This insignificant little strip was the most fun I've had in a long time. There are 3 layers there, though technically 5. Figuring this out in the weave software was enormous fun. At this point I need to say a huge thanks to my weave teachers Julie Holyoke and Eva Bassile - their help in all these projects is amazing. Back to the weaving. This is something I have wanted to try on a jacquard for about 4 years now. Remember my phd proposal Belly? Well this is some of the work that I wanted to research. It's based on plant cellular structures. This one in particular is based on stomata - the plant breathing cells in leaves. 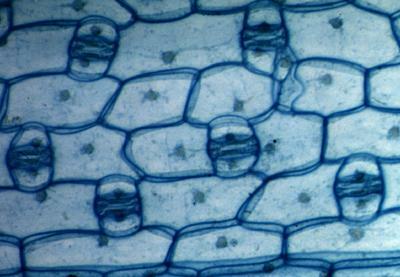 pic from this page - http://sciencevogel.wikispaces.com/Pictures+-+leaf+%26+stomata - also a better explanation. This is still just in the sample phase - can you notice the curved shape where the multi layering starts? So I created a single weft multi layered fabric that hopefully resembles the stomata. Multi layered cloth is easy enough on shaft looms but getting the cellular shape and the speed of production and flexibility of control is only possible on a computerised jacquard. I do love it! I have another day on Monday on the Dalmatica which is when I plan to produce the finished piece - fingers crossed! Oh and this is the view from the classroom.